For most of us the ideal garden will consist of flowers that provide continuous color through the summer and attract bees and butterflies. 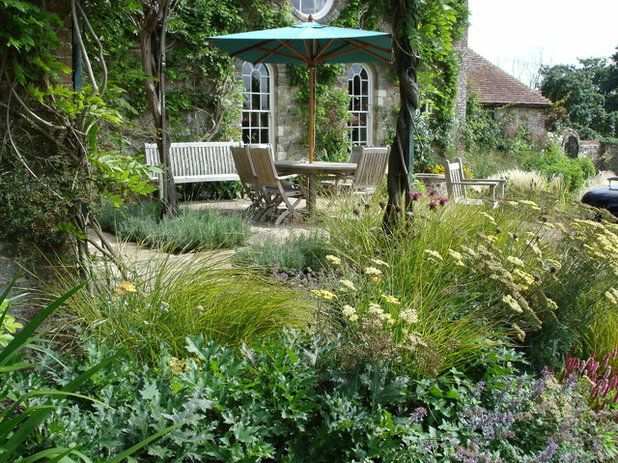 To achieve this we need a carefully planned planting scheme and a choice of suitable plants. 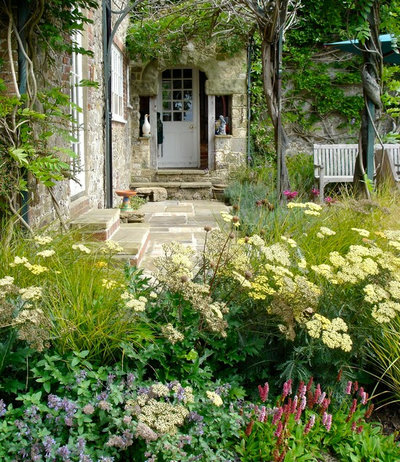 This article by Lauren Dunec Hoang which I found on the Houzz website describes seven gardens which demonstrate how this can be achieved. Designing a summer flower garden that’s as attractive to people as it is to native pollinators takes a little bit of thought and planning. The good news is that the same design principles that make dynamic, long-lasting summer borders — choosing plants that bloom in succession, including a variety of bloom types and grouping plants in clumps — often also create a garden that’s an oasis for pollinators. 1. Cottage-style border in the United Kingdom. This overflowing bed in Hampshire bursts with cottage-style garden blooms in a classic pastel color palette of lemon yellow, lavender and pink. The showiest flowers are pollinator-friendly, including masses of beebalm, yellow yarrow, purple catmint and mounds of lavender farther back along the stone patio. The designer chose to group plants into swaths and small clusters, a tactic that creates soothing masses of color and acts as an easy-to-spot target for visiting bees and butterflies. 2. Bursting with blooms in Ohio. 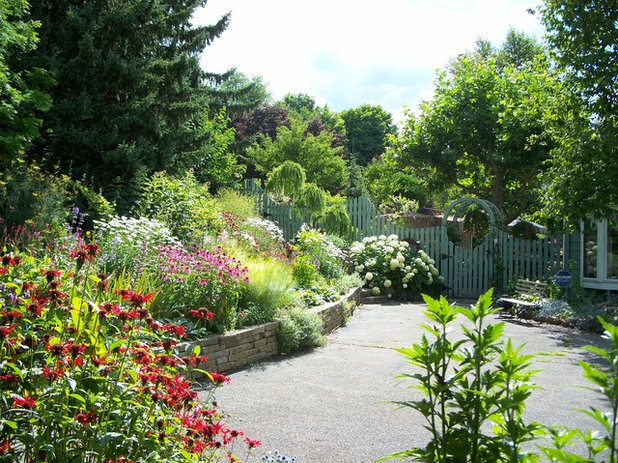 Layers of colorful perennials, flowering shrubs and billowing ornamental grasses make for a standout backyard pollinator garden in Cleveland. Growing nectar- and pollen-rich flowering plants that bloom at different times can be a great way to ensure that you always have something to enjoy in the garden and that pollinators have a steady food source. Consider this mix of plants that feature successional bloom times: Spring-blooming salvias, late-spring blooming lavender, summer-blooming beebalm and catmint and late-summer into fall-blooming coneflower and Sedum ‘Autumn Joy’. 3. Wild garden in New York. This pollinator garden bordering woodland in New York provides a colorful landing spot for native birds, bees, butterflies and other insects. 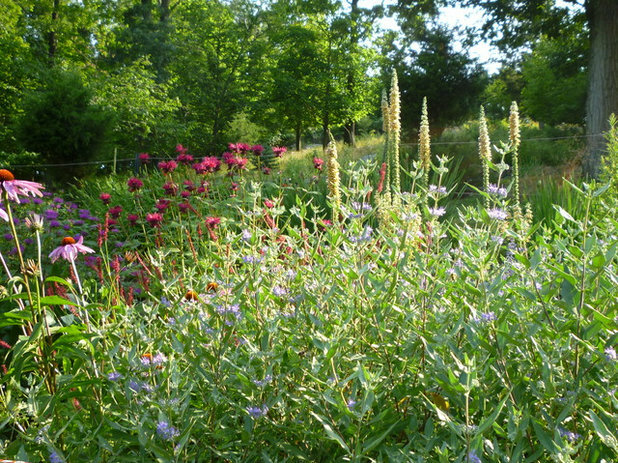 The designer used a mix of North American natives like beebalm and coneflower and introduced species like bluebeard — a bee magnet — and butterfly bush.